From writing episodes of The Simpsons to The Tonight Show fallout with NBC, Conan O'Brien's comedy career has taken various shapes and forms over the past 24 years. 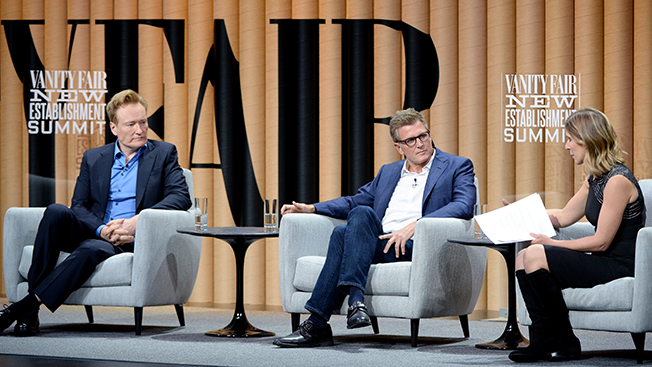 Speaking about those changes with Kevin Reilly, president of TNT and TBS—home of Conan—during a panel at Vanity Fair's New Establishment Summit, the late night host talked about how social media and new video formats like virtual reality are shaking up how he creates content for digital platforms and his TV show. For instance, last week he shot a segment using a YouTube virtual reality headset. "It couldn't be further from the world that I started in," O'Brien said, referencing his longtime TV career. "When I walk around in the world, the people who are most heartened, [the] most intense, emotional fans are usually about 18 years old and it's because they've watched this content that they really love." Most of that newfound fandom stems from Team Coco—the digital brand he started after NBC famously prohibited him from appearing on TV after leaving The Tonight Show in 2010. "The tour that I did right afterwards is what propelled me into social media," he said. "I did not choose social media—social media was an absolute necessity for me to survive. Anyone else in my situation 10 years earlier would have just gone away." He added, "I could probably point to five different times in my career where I had to change and adapt. I've found that rather than be afraid of that—initially it was fear if you go towards it, [since] many experiments will fail—it's much more interesting when you hit on something new and it works … it's exhilarating." Content isn't the only area where O'Brien is experimenting. During its upfront this spring, Turner launched a branded content studio for O'Brien. The studio has worked with Universal Pictures, Pepsi, Snickers and AT&T. In one example of what O'Brien looks for in brand deals, Team Coco worked with Universal Pictures in January to create a prank video that promoted the film Ride Along 2. The clip follows O'Brien and one of his staffers who is getting her driver's license. The two go for a ride and O'Brien surprises her by picking up the film's stars Ice Cube and Kevin Hart along the way. The only time that Universal Pictures was mentioned happened on-air when the segment cut back to Conan's show and he gave a quick plug for the film. The clip has since picked up 38 million views on YouTube. "I can't go anywhere without people talking to me about that clip," O'Brien said. "What's interesting is that I forget that it was actually an integration." The spots don't feel like commercials, he said, because, "it's comedy that we like. We always tell [brands], if it's not funny to us, I can't do it because you lose, I lose, everyone loses." O'Brien also has a segment called Clueless Gamer where he reviews video games, even though he's not a gamer. The series started in digital and O'Brien eventually started working with brands to create clips of himself playing with celebrities. "I always tell them ahead of time, I'm going to trash the game, I'm going to make fun of the game—you in no way have editorial control. What's great is they say, 'No problem. You have no credibility,'" he joked. "Because I have no credibility, it's a good business arrangement, we're very upfront about it, the gaming community loves it." Meanwhile, Reilly talked about the network's ongoing experiments with reducing TV ad loads by up to 50 percent for programs like Animal Kingdom. "That specifically comes from trying to be more tuned into the consumer experience and how people want to watch television," he said. "I think it's something that every advertiser would admit, that the ad is more effective when it's in a better environment and we have stuffed the airways with too many ads." While initial tests with TNT have been successful, Reilly added that the program has to show advertisers that it is effective since the network charges advertisers more to run less ads. "It's a simple formula: If it's more effective, we're going to charge more."